I have just ordered two pairs of mules from New Look. I used to like to wear a pair of my sisters, when I first started wearing heels. I recently started looking for a pair for me and most were open toed (for summer), until I found these. I picked up the two pairs ordered today. 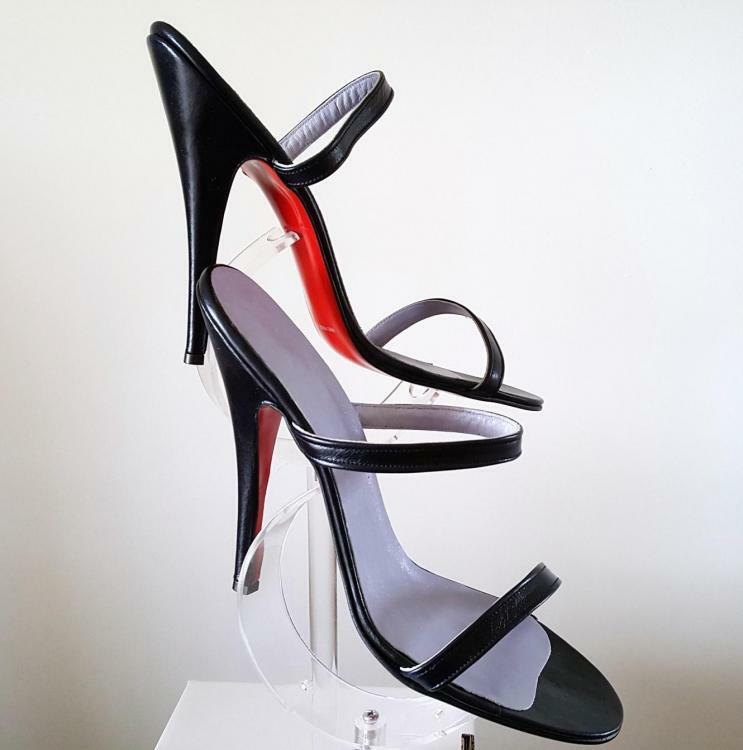 I prefer the look of the stiletto pair. It has no seams showing. The block heel shoes have a seam/line going down the front and across the width too (won't be noticable when worn though). Both are wide fit (i don't know if there was a non wide fit version) but they fit fine. They will look like boots if worn with long enough trousers/jeans. 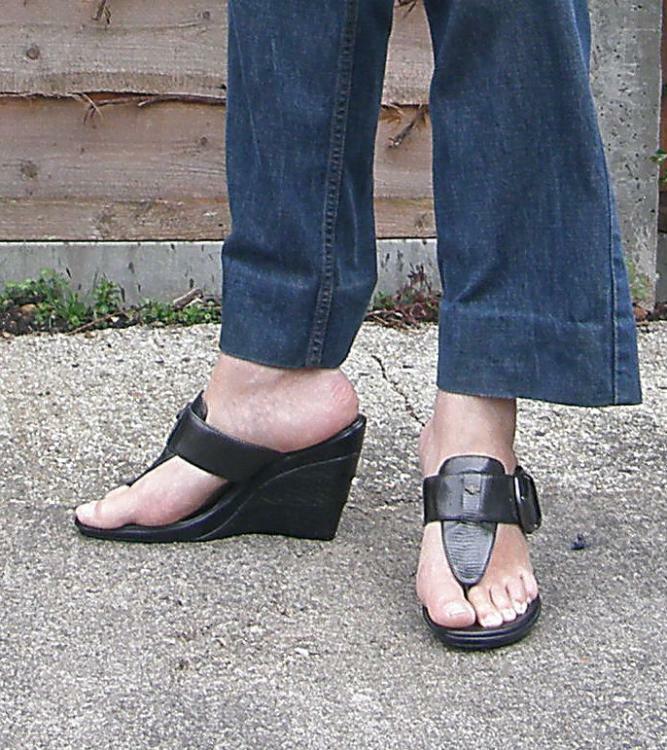 Been trying to find a pair of mules for wearing around my flat, just not found any I like. I really like mules. Given a choice I would own some Karo ones shown elsewhere. 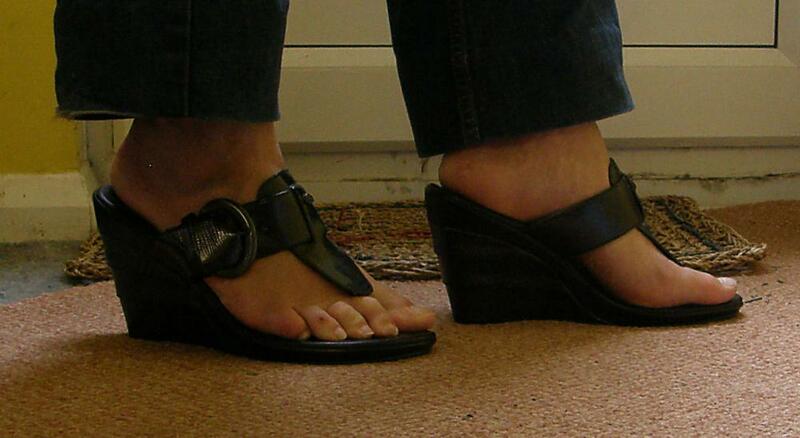 They come with a very high wedge heel, and clear perspex cover with open toes. Lovely! The ones shown here are nice, but I would prefer a higher heel. If I remember these styles come with a very wearable 4 inch heel? Nice, but not much of a challenge, and wearing a heel out is the only exercise I get at the moment. I had spotted the second pair with a view to doing the same, wearing them as a boot, but something that slipped off easily when shoe shopping. I've seen and tried on something similar at Zara but my foot wasn't comfortable in them. The bit at the back of the heel felt like a blister-in-waiting so they were returned. Those are nice. They would be good in hot weather. 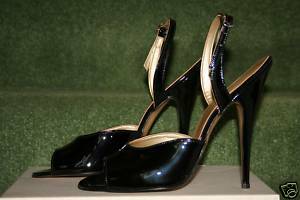 I have a pair with the thinner 110mm heels. I am wearing them now. Absolutely fine when you are used to walking in them. I like them because I can slip them on and off easily (not that I slip them off very often). Would you have a photo of this pair. Just bought this pair from New Look. In stores at the moment. A good summer shoe. With a long trouser, maybe even suitable for walking along a promenade somewhere? I've never managed to do the flip-flop thing, or anything else that involve separating my big toe from the rest. Mrs Freddy practically lives in them, so it must be a case of just getting used to that toe post? Your feet are in good 'shape'. I mean that quite literally too. When I first saw this, I thought the picture was yours.... Them's quite manly ankles (rather like mine). Turns out, that picture is the one from the New Look web site!! I like the style of the shoe, and the price is good too. It's close to something I've been looking for .... Can't be doing suede though, so I won't replicate your purchase. One day, I will own some mules that stay where they should, will be comfortable, and I'll get to wear them out in warmer weather. I'm wearing these toe-posts as slippers - on straight out of bed in the morning, until I change into my day heels. I'm definitely feeling the pull on my tendons when I take my heels off at the end of the day! I'm trying to psyche myself up for stilettos in public. I'm trying to psyche myself up for stilettos in public. 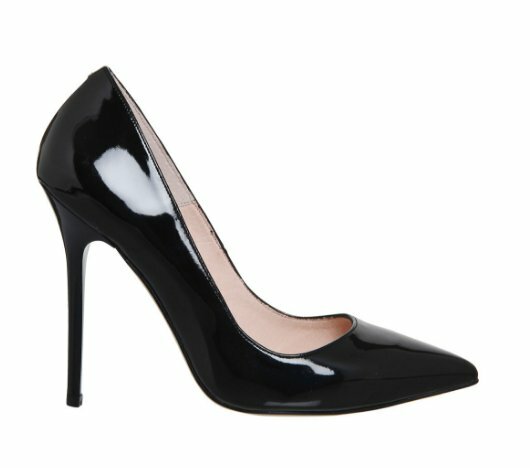 Stiletto heels in general, or stiletto courts? I've done the stiletto heels in public many times, but not recently. I almost never wear them on paved streets now, having scuffed up at least two pairs of heels when they found cracks the heels sank into. I pair was terminally damaged. I now protect the heels with heat-shrink material (two layers) that has at least once saved a heel when it found a hole to fall into. My preference for a slim heel, is now shopping malls. No cracks, or holes for a heel to find. They are noisy places too, generally. I get spotted in shoe shops almost immediately in a slim heel. Maybe the way I walk, or more likely the sales staff looking for potential customers? (Or evidence of being a previous customer?) 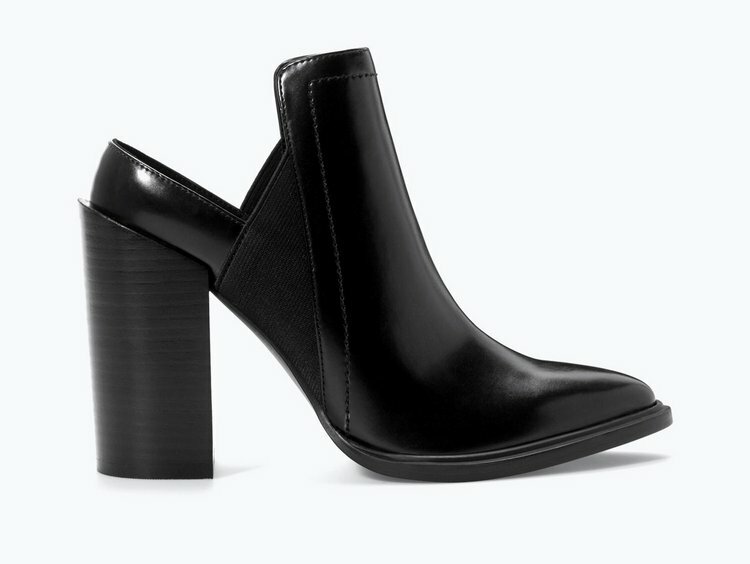 If I wear a slim heel, it's almost always going to be in the cooler months when nights are longer. Typically I leave home and return in the shoes I spend the day in. I would not risk getting spotted in a slim heel where I live, though coming home in the dark usually presents no problem. Having said that, I did -possibly- get spotted one night. I walked up to the house in a slim heel well after midnight, only to realise a neighbour was hanging out of a bedroom window smoking a cigarette. I have worn stiletto courts to a couple of gigs. One of them, I got to walk around the venue for ages in them, completely unintentionally. They were poorly made, though I thought fitted well. An inner seam eventually cut my foot which took some time to heal. Full details >> here <<. Later this month I'm hoping for something of a repeat performance: I'm going to see him again at the Royal Festival Hall. I also hope to be wearing stiletto courts, though my companion is less keen. Not a great place for a slim heel either, as the area has a significant amount of cobbled pathways. I certainly won't be walking around like I did at the Barbican either. I've checked for parking, and believe I've found somewhere that I can use without payment. Meaning I shouldn't need help to get out of the place, as before. Conversely, if you want to get noticed, try walking in a stiletto with a metal tip. Absolutely delicious sound. 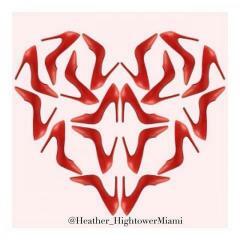 Any stilettos! Boots would be more stable (like the ones I bought from you), and in shoes I have nothing between 4 inch courts and 5.5 inch courts, both with no platform. I have higher ones with platforms but don't really like them. 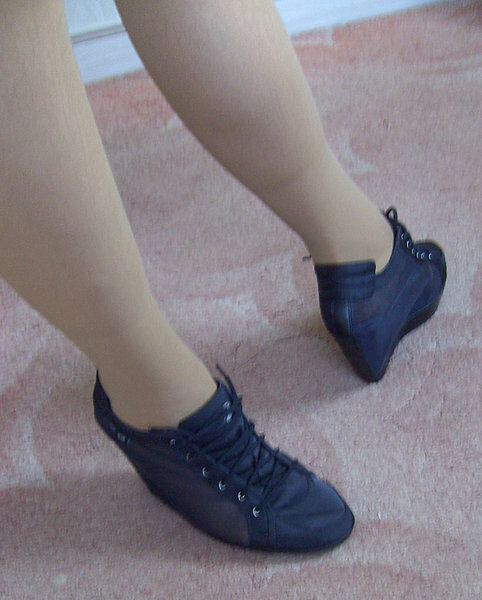 The 5.5s are a bit high for me for everyday walking, and the 4 inchers are a bit big so not so stable as they might be. Office courts are highly recommended. Their UK8 comes up a good half size small. UK8. Brand new and boxed. If it isn't a 5 inch heel, it's very close. Currently £20 plus £3-50 delivery direct from Office, although they haven't any stock of this size left. I'd be happy to send for the same money if you are interested. I can email detailed pictures if you might be interested. I'm very tempted but I have a pair just over 4 inches I'd wear if I get round to it. They have a very thin stiletto! I also have the boots you kindly supplied plus another pair with a bit of a platform. I have several pairs of stilettos with platforms, up to 7.5 inches, but obviously something a bit more subtle is the order of the day most of the time! Today I'm wearing my Adidas thin wedge trainers which are quite nice with no socks and have a 5 inch heel. Today I'm wearing my Adidas thin wedge trainers which are quite nice with no socks and have a 5 inch heel. Have we seen a picture of these? Not sure. Here they are. I don't normally wear beige stockings at all but these show the detail of the shoes more. It's not a brilliant picture, but the heels are about 5 inches with an inch platform, really narrow. Found this pair of mules on Ebay. They are from Leatherworks. Nice! Are you bidding or have you bought them already? Starting price was in the 'affordable' price range, with only one bidder so far. You may find both pairs shown are from the same seller. I did notice that he also had a pair shown here listed but not in my size. I remember some time ago I did buy a pair of heels from leatherworks like the pair shown here but with a slingback strap. There was no way I could fit my feet in them so got returned. I even managed to find a photo of the pair I'm talking about.